Doogee Mix is an affordable smartphone that seeks to rub shoulders with new heavyweights boasting ‘bezel-less’ display. Its Chinese maker provides decent specs for the price as well, including a speedy octa-core processor, ample RAM and dual camera setup. This impressive device parades a design language somewhat similar to that of a Xiaomi device. The Doogee Mix is not the most beautiful we have seen, but it looks tidy. The slightly curved edges improve the look. The design is solid and colourful with a body that benefits from a micron scale vacuum ion plating technology. A key selling point of the Doogee Mix is its Super AMOLED display. This is not because it promises the most jaw-dropping clarity – the 5.5-incher has HD (720p) resolution, but the inherent superior display quality of OLED sounds interesting. Its very thin bezels are the focus. 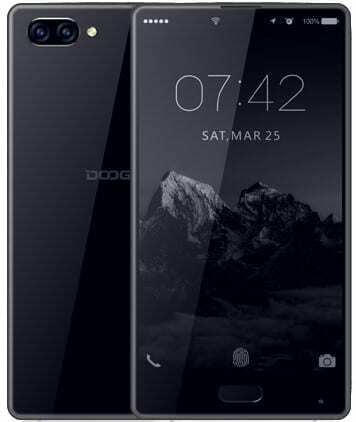 To an extent, this puts the Doogee Mix in the same class as heavyweights such as the Xiaomi Mi Mix 2 and Essential Phone. There is also Corning Gorilla Glass 5 protection. Interestingly, the Doogee Mix also looks to compete with other new, usually more expensive, offerings in terms of camera. You will find two sensors – 16MP and 8MP – on the rear, both have f/2.0 aperture. It offers phase detection autofocus (PDAF) and LED flash. Its Chinese maker promises DSLR quality shots. For selfies, the Doogee Mix offers you a 5MP snapper with f/2.2 aperture. The main camera shoots Full HD (1080p) videos, while the secondary produces HD (720p) quality at 30 fps. This affordable device appears to be no slacker in terms of performance as well. The Doogee Mix packs an impressive MediaTek Helio P25 octa-core processor zipping along at speeds up to 2.5 GHz. You can have your unit with either 4 GB or 6 GB of DDR4 RAM. Either way, enjoyable performance is not out of the question. Storage is also abundant at 64 GB or 128 GB, and expandable as well. Android 7.0 Nougat OS ships with the Doogee Mix. There is a fingerprint scanner to offer an extra layer of security. The dual-SIM phone offers LTE (Cat. 6) with VoLTE and gets juice from a 3,380mAh battery. Doogee Mix is not officially available in Nigeria, but you may be able to buy the phone from a third party seller at Jumia. The price starts at $159.99 at Gearbest. Doogee Mix Price in Nigeria is expected to range from 60,500 Naira to 110,000 Naira depending on your location in Nigeria.